Unleash the fun of summer everyday with this instant Wash Off spray. Enriched with coconut water, well-known for its supremely hydrating and pH balancing properties, hydrate your skin as you tan. With no commitment, this tan is easy to apply, is transfer resistant and conveniently washes off. Perfect for legs and that last minute event or to top up your existing tan. 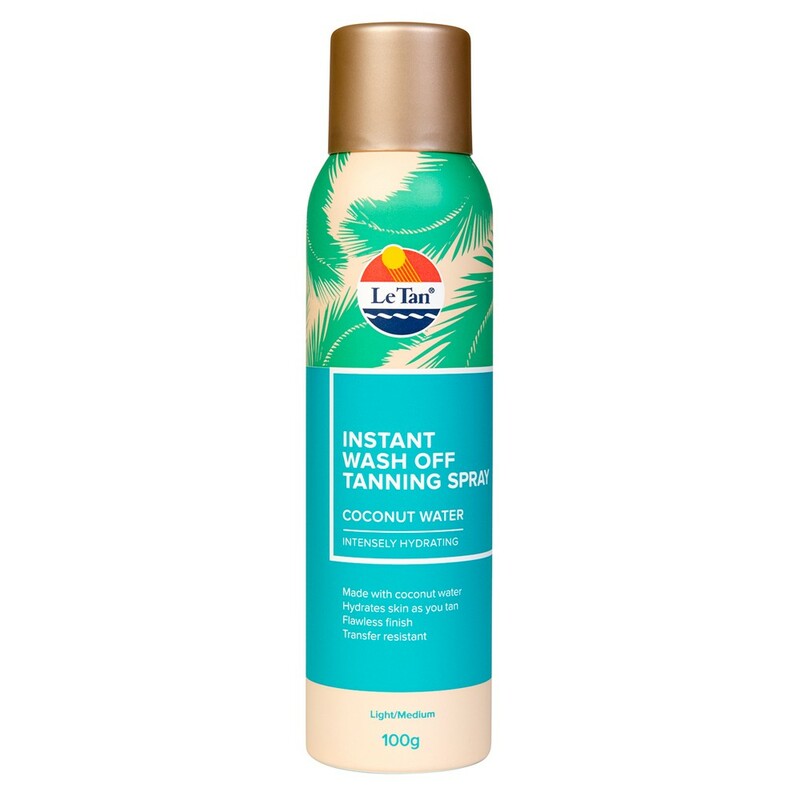 Enriched with coconut water to hydrate your skin as you tan, for an even and long-lasting result. Shake well. Hold can 15cm away from skin and apply directly, spreading smoothly with your Le Tan® Application Mitt or hands. Allow to dry for 60 seconds before dressing. Wash Application Mitt or hands with warm water and soap after application. Use soap, warm water and the Le Tan® Exfoliating Mitt to remove tan. Water, Butane, Isobutane, Cyclopentasiloxane, Cyclohexasiloxane, Propylene Glycol, Polyglyceryl-4 Isostearate, Cetyl PEG/PPG-10/1 Dimethicone, Hexyl Laurate, Disteardimonium Hectorite, Phenoxyethanol, Tocopheryl Acetate, Sorbitan Isostearate, Ascorbyl Palmitate, Potassium Sorbate, Cucumis Sativus (Cucumber) Fruit Water, Cocos Nucifera (Coconut) Fruit Extract, Fragrance, Propane, Titanium Dioxide, Iron Oxides. Use in a well ventilated area and avoid spraying close to hair, clothing, fabric or carpet, as this product may stain. Test on a small area first, if irritation occurs, discontinue use. This product does not protect from UV rays. Intention misuse by deliberately concentrating and inhaling contents can be harmful or fatal. STORAGE AND DISPOSAL: PRESSURISED DISPENSER. PROTECT FROM SUNLIGHT AND DO NOT EXPOSE TO TEMERATURES EXCEEDING 50°C. This is my favourite wash off tan! It’s easy to put on, even just using your hands. It creates a nice natural looking tan, but nothing fake looking. It doesn’t rub off on to my clothes, and it lasts a couple of days unless you exfoliate/shave. It smells fine, and seems to be quite hydrating, easyenough to just shave my legs and then put this straight on after without moisturiser.